According to Wild Orchids of Southern Africa, written by Stewart, Linder, Schelpe and Hall in 1982, there were over 400 known orchid species, distributed between 54 different genera, in South Africa at that time. Undoubtedly, more have been discovered and named since then. 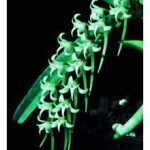 As is the case with Australian native orchids, terrestrial species outnumber the epiphytes and lithophytes by a considerable margin. And, as also the case in Australia, many of the terrestrials are difficult to procure and cultivate. The species described below are, for the most part, fairly easy to acquire in Victoria. I grow all of them, some more successfully than others. Disa uniflora is without doubt South Africa’s most well known terrestrial orchid. Although fairly widespread in southern Africa, its best-known habitat is Table Mountain, where it grows on sandy stream banks and on mossy rocks beside waterfalls. It has been cultivated in Europe for well over a century and the late Ron Pearce first grew it in Melbourne at least fifty years ago. Disa uniflora produces its spectacular red or orange (rarely yellow) flowers in December and January, and is one of the few cool-growing orchid species that reliably provides a colourful Christmas floral display. After experimenting with a variety of potting media for many years, I find that Sphagnum moss produces best results, provided that it is replaced each year. March, when the new growths begin to develop, seems to be the best month for re-potting. The moss should never be allowed to dry out for long. Most of my plants are grown with their pots immersed to a depth of 8-10 mm in a tray containing a weak solution of liquid fertiliser (Peters Professional®, N:P:K = 18:8:15, 200 ppm). Although there are over 300 other Disa species native to Africa, only a few are amenable to cultivation. The only one (apart from D. uniflora) that I have managed to maintain in cultivation for over ten years is the much smaller D. tripetaloides. It usually produces its small white (or pink) flowers in January. Others species that have been used in hybridising include D. aurata (yellow), D. cardinalis (red) and D. racemosa (pink). One other disa species, D. bracteata (once known as Monadenia bracteata), is infamous for having been introduced accidentally into Western Australia in the 1940s. This unattractive, self-pollinating species has spread east as far as Victoria, despite all efforts to eradicate it. The terrestrial Pterygodium catholicum is the only species in this genus of 13 species that I have seen in Victoria. It has small pea-sized tubers that can be cultivated in exactly the same manner as greenhood (Pterostylis) species. The small, hooded greenish yellow flowers, 5-8 per inflorescence, usually open in September. Like most greenhood orchids, they must be allowed to become dormant during summer. Grown in this way, they reproduce rapidly, each tuber giving rise to 3-5 replacement tubers every season. Flowering is sparse unless the dormant tubers are treated with ethylene gas (provided by a banana skin in a plastic bag) for 2-3 weeks during January. Much more satisfying are the flowers of several Satyrium species, especially S. carneum and S. erectum, which produce a tall spike bearing a succession of white and pink or pink flowers, respectively. Neither of these species is as yet widely available in Victoria but S. candidum, a species with small greenish white flowers, occasionally appears on our sales benches, no doubt because of its greater rate of multiplication. Another spectacular South African terrestrial species, which I admire but have yet to acquire, is Bonatea speciosa. 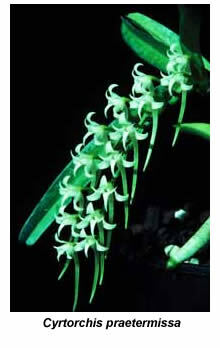 It can stand up to a metre tall, and bear a cluster of a dozen or more large, spidery green and white flowers. 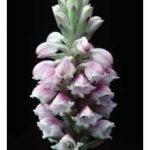 One of the most widely grown South African species is Stenoglottis longifolia, which produces a tall inflorescence bearing a succession of small pink flowers in late autumn. It grows as a lithophyte in Natal but in cultivation it seems to do well grown under cool conditions in a range of potting media, including pine bark/moss, perlite/sand and various terrestrial mixes. Stenoglottis woodii has a smaller plant that flowers in December and January. The white (sometimes pink) flowers (up to 40) are produced successively, a dozen or more being open at the same time. It is native to Natal and Transkei and does slightly better for me when grown with winter warmth. Stenoglottis fimbriata is the most common of the four known species in nature and is well known in Victorian collections, but not in mine, as I eventually killed the small seedling I acquired several years ago! I also grow S. zambesiaca but it is not a native of South African, being found (presumably) in the Zambesi River basin. Most of South Africa’s epiphytic orchids seem to grow in the northern provinces of Transvaal and Natal, and many of them are found further to the north in adjoining countries. 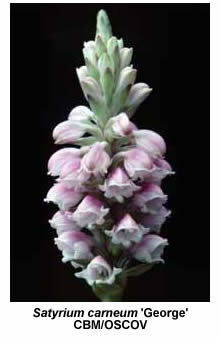 About ten species of the genus Polystachya are found in the Republic of South Africa but over a hundred others are to be found in tropical Africa, while a few species grow in tropical America and Asia. The most commonly grown in Melbourne is Polystachya pubescens, which in nature is found on rocks or trees in cool, shady places. Its upright inflorescences bear up to ten yellow flowers, each about 20 mm across. The lateral sepals and labellum often have horizontal, orange stripes and the flowers are held with their lips uppermost. I grow this species under intermediate conditions (12˚C minimum) and find that it does best in a pot using river pebbles as the potting ‘mix’. Two species of the African genus Cyrtorchis are fairly common in the Republic of South Africa. Cyrtorchis praetermissa is usually found in the upper branches of shady trees near rivers, while C. arcuata is also found on boulders and rock faces. The flowers are white or cream, those of C. arcuata turning orange as they age. These species have few roots but they are extremely thick, being designed to cope with the “hostile” environment in which they grow – it’s said that the temperature may often range from freezing to 38˚C on the same day. In addition to these species, I also grow two African bulbophyllums, although only one (Bulbophyllum scaberulum) is found in South Africa. The other (B. maximum) is native to tropical Africa. Both are members of the section Megaclinium, which is characterised by furrowed pseudo-bulbs widely-spaced along the rhizome. The small flowers are distributed alternately on either side of the flattened inflorescence and open sequentially over several weeks or longer. They are grown for the novelty of their plants and flowers, not for their beauty or perfume. Other South African epiphytic species in cultivation in Melbourne include Ansellia africana, Mystacidium capense, Aerangis mystacidii and Jumellea filicornoides. Although I grow the latter, it has yet to flower. Nevertheless I feel confident in recommending it on the basis of my experience with other jumellea species (from Madagascar), which grow rapidly and produce their fragrant, white flowers several times each year.